It all started the week before Thanksgiving when my mother decided she wanted to have some wine with her Thanksgiving dinner at the care center. Her doctor approved her having a glass of wine, and her table mate’s doctor’s approved them having a glass of wine as well. So my mother asked me to bring her a bottle of the yellow tail wine I drink so she could share it with the group at her table. I said I would bring her some of the little individual serving bottles I can get at the grocery store. I’ve taken these little individual serving bottles of wine to the care center for my mother in the past, and she puts them in her closet for a ‘special occasion…” But, apparently they have a thief among them because when my mother went to get the wine, it was gone. I was not happy about it and said I was going to ask for a meeting with the department head to bring it to their attention, However, my mother got scared that it would somehow look bad on her for making a fuss about it and asked me not to mention it so I let the matter go. On Thanksgiving, my husband, Bill/Bro, and I went to the care center to visit my mother and take her the yellow tail wine. My mother insisted we bring six individual bottles so she and her table mates could have two glasses each… I agreed because her doctor wrote an order saying she could have wine, and the duty nurse said he would hold her pain meds for that evening. When we arrived at the care center, I asked my mother where she wanted me to put the wine. The activity director came by and my mother called her over and asked her where she could put the wine until dinner time. The activity director gave me a permanent marker, and told me to write my mother’s name on the wine, and showed us a refrigerator in the physical therapy room where we could put the wine. She showed my mother what shelf the wine would be on so my mother could reach it and get it out for herself when she was ready… The duty nurse also was made aware of where the wine would be just in case mom needed any assistance. All was good and my mother was happy and excited that they were going to have their wine with their Thanksgiving dinner. Yesterday, Friday, my mother called me in a panic to say she didn’t get to have her wine on Thanksgiving because it was gone. I asked her what she meant by ” gone” and she said “someone took it.” I said “well this time, mom, I am going to ask for a meeting with the duty nurse, activity director, and the head of the care center, Alan. I said I think it’s time they know this stealing activity they have going on in the care center needs to be addressed. At that, my mother said “no, Cindy, I don’t want you to do that, because someone will get fired. I said “if they are stealing from the residents, or the care center, mom, they need to be fired.” Then, my mother said “if you do that, and get anyone fired, I’m going to fire you.” I told my mother “then fire me mom, I really don’t care.” That ended our conversation. My mother’s favorite phrase to me has always been “I’m the matriarch, and everyone has to do what I say.” When my mother says that to me now, I let her know I don’t dance to that tune anymore… I don’t believe in that, and I refuse to let anyone be in a position of dominance or power over me ever again. I treat people with dignity and respect, and I expect them to treat me the same way. I don’t believe anyone should have to “bow down” to anyone’s demands just because they are your mother, father, sibling or child. I also don’t believe that just because someone reaches a certain age, they can declare themselves beyond being held accountable for their actions and/or how they treat people. Yesterday I posted that my mother is upset with me for several reasons but mainly because I can’t, or won’t, always do what she wants me to do for her… It’s an ongoing thing with my mother and I. One day I’m the hero, and the next day, she gets upset with me about one thing or another, says she doesn’t want to talk to me anymore, and hangs up the phone. I’ve learned to take it one day at a time with my mother because, if I get upset then it affects my day, and the next time I see my mother she will have either forgotten all about it, or decided she wants to forgive and forget… These things happen in some families. Today when I went to see my mother, she gave me a peace-offering. 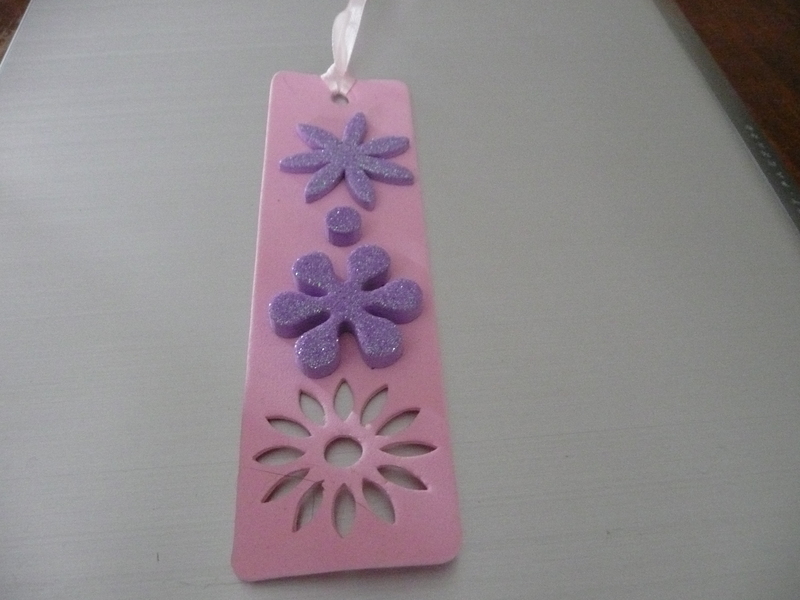 She made two of these in arts & crafts, one with green flowers, and this one with purple flowers. She asked me which one I liked best, and I said the purple one, so she gave it to me saying she made it for me to keep. That’s how my mother forgives and forgets… she doesn’t talk about what happened, she just gives you something as if that makes it all OK so it doesn’t have to be discussed… I took the book mark, thanked her, and gave her a hug. At this point in her life I know nothing I’m ever going to say is going to change her…so the best thing I can do is keep trying to change how I react to her when she gets upset with me… I’m not in any position to judge anyone. I’ve certainly made my share of mistakes, and I’m sure I can rub people the wrong way too. 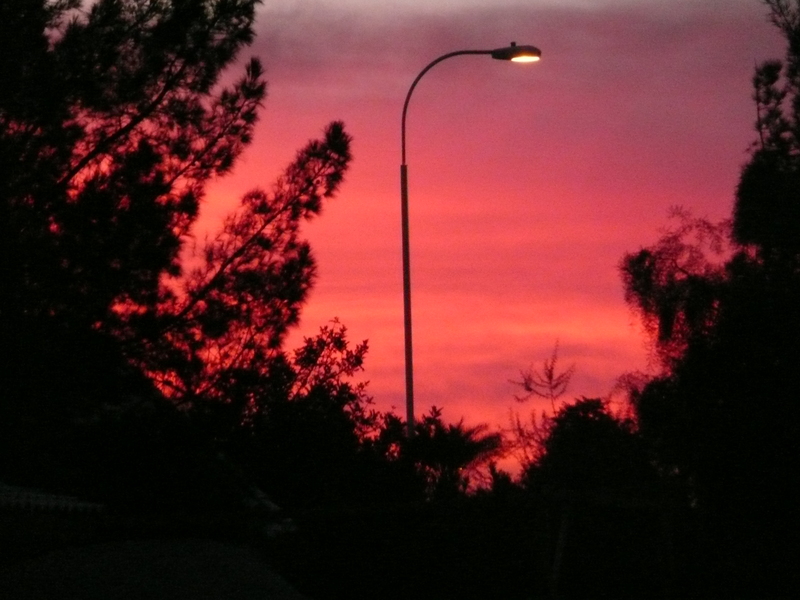 But, the one thing I always try to keep in mind is EVERYDAY is a BEAUTIFUL, BRAND NEW DAY… Just like this beautiful sunrise that greeted me this morning when I opened the family room picture window. I wish everyone a very Happy and Blessed Thanksgiving! It’s that time of year again, when my husband, Bill, and I have to decide on the insurance plan we will use for the upcoming year. Bill’s company gives three options to choose from. But, in reality, there is only one choice for us, because, the other two options are so high in out-of-pocket experiences, we just couldn’t afford them. So we stick with our usual plan, and complain about it from the enrollment process, all the way through the end of the year… However, we are truly thankful we have an insurance plan at all. I met Bill at his company this morning so we could participate in our annual bio-metrics screening process.. What a great way to start off an otherwise perfect day right? 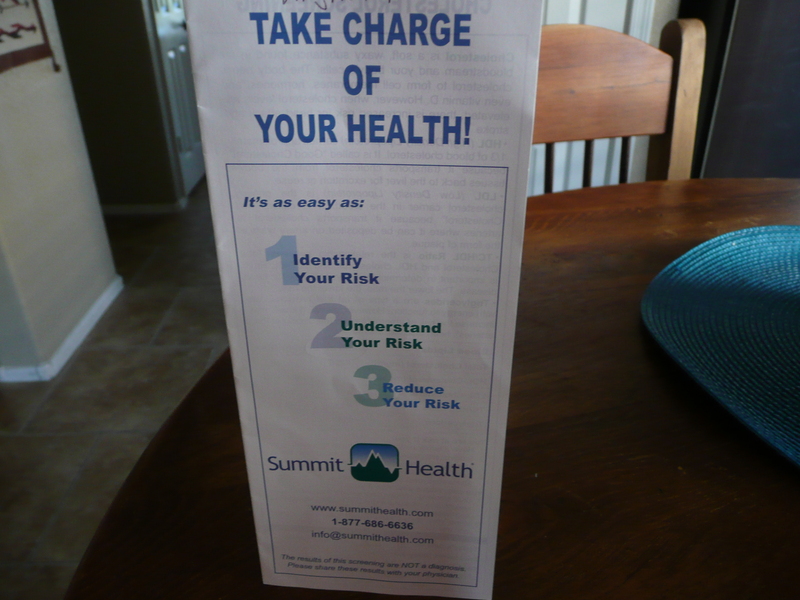 Upon arrival you are ushered into a private room where your finger is pricked, and blood pulled into a tiny little tube, that will go into a machine that will produce your cholesterol, and blood glucose levels. These numbers are documented on your screening sheet so you “know your numbers” when your nurse coach calls, TWICE later in the year… Oh, more fun. 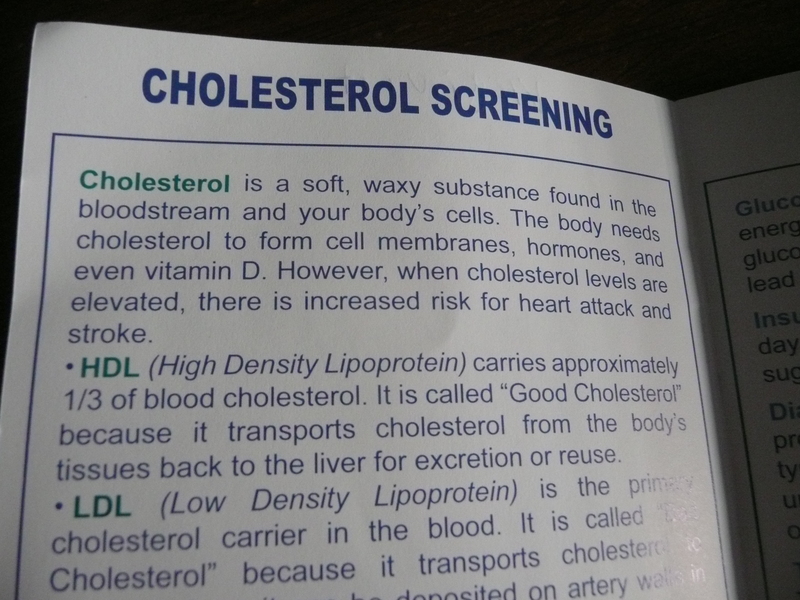 ” I am proud to say my good cholesterol was over 100, and the nurse told me if that could be bottled… people would not have heart problems… Yeah me!!! 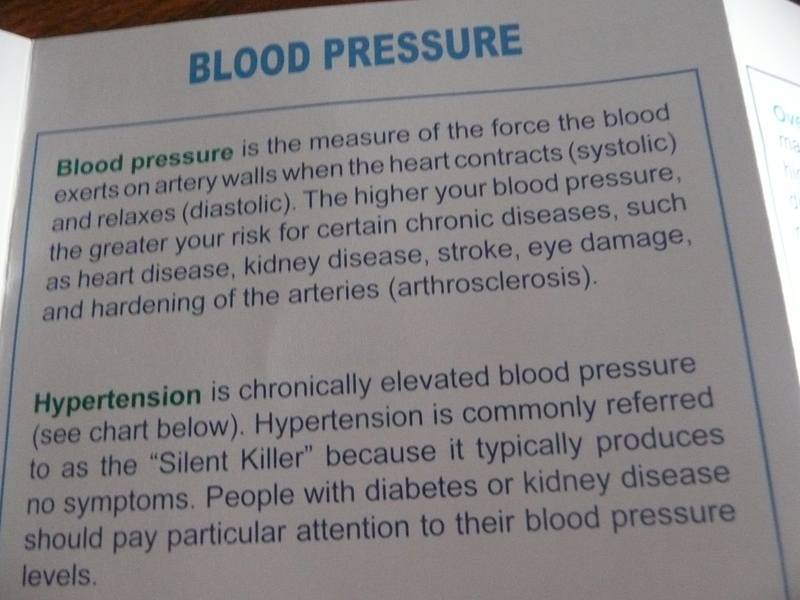 Once your cholesterol and blood glucose levels have been measured, they move on to your blood pressure and body composition. 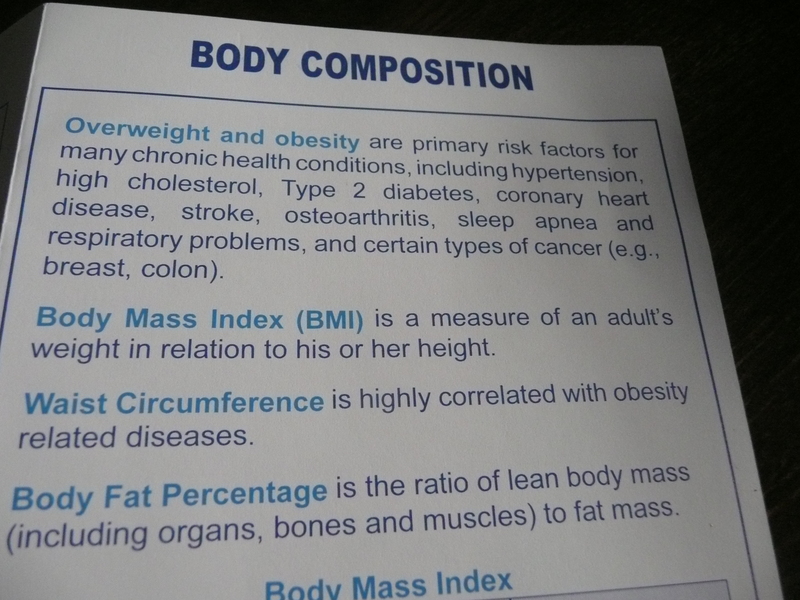 In other words, time for the dreaded, getting weighed and measured… Even more FUN…! 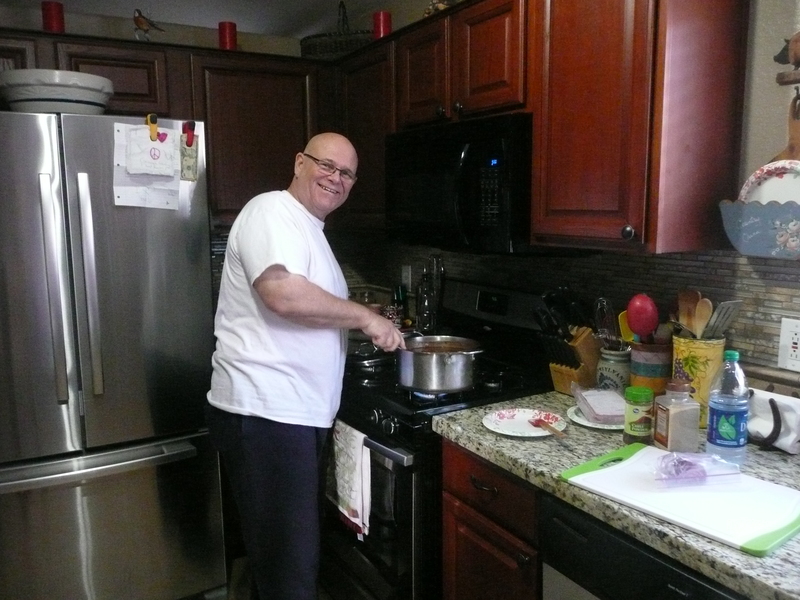 However, that said, at 61 years of age… I am more interested in enjoying life with my husband, Bill, family, and friends, knowing that we are doing the best we can, everyday, to stay as healthy as we can, without starving ourselves…. I’m so over that…! 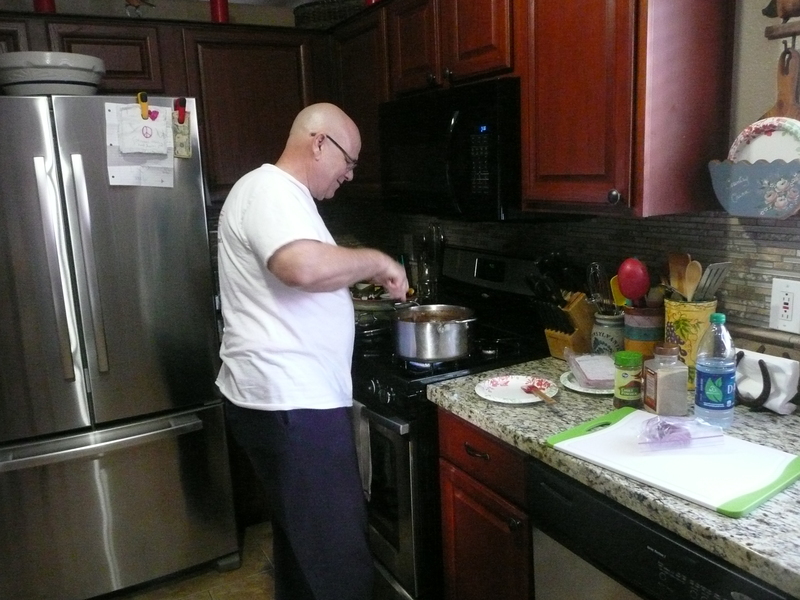 I love fresh garlic and use it in just about everything I cook. 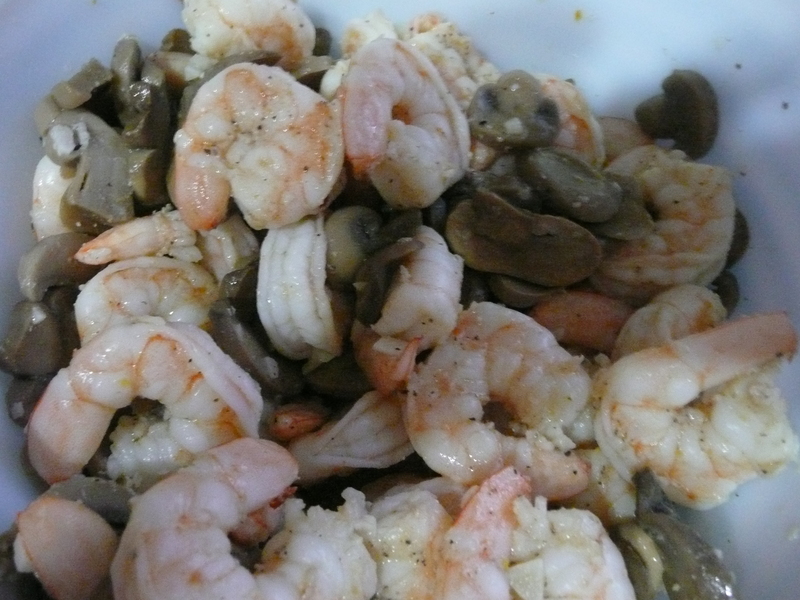 I also love shrimp and try to have a shrimp dish at least once every other week, i.e. shrimp soft tacos, my shrimp/seafood jambalaya, or this garlic shrimp noodle dish, that both my husband, Bill, and I just LOVE… YUM!!! 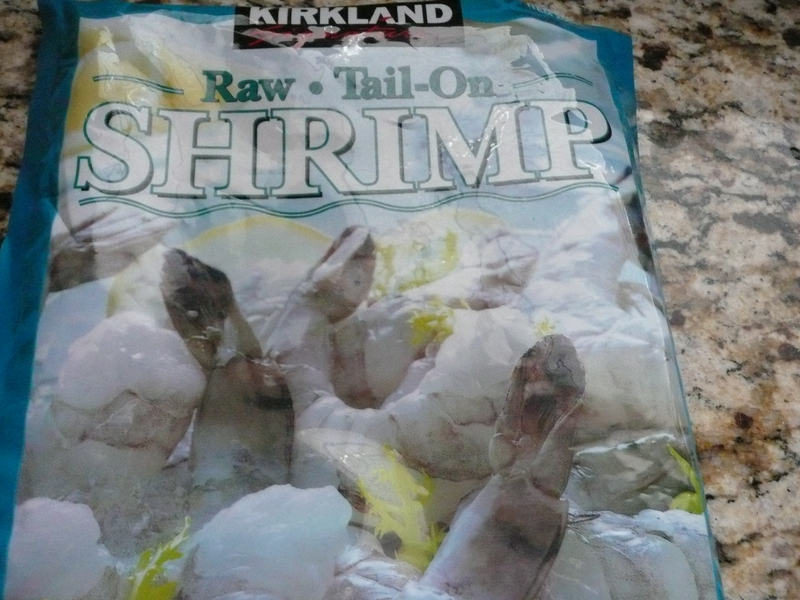 I buy frozen shrimp from Costco that have been cleaned and deveined. 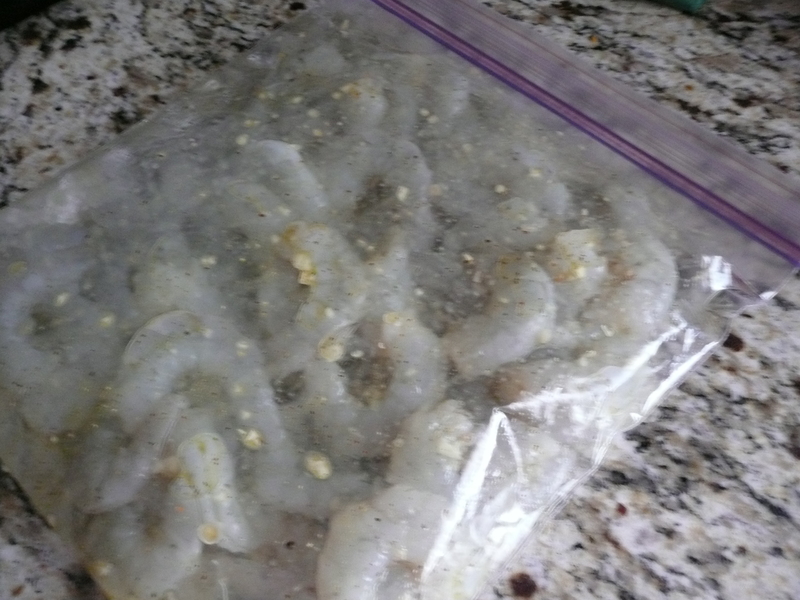 Thaw the shrimp in the refrigerator overnight. Rinse the shrimp and remove the tails. 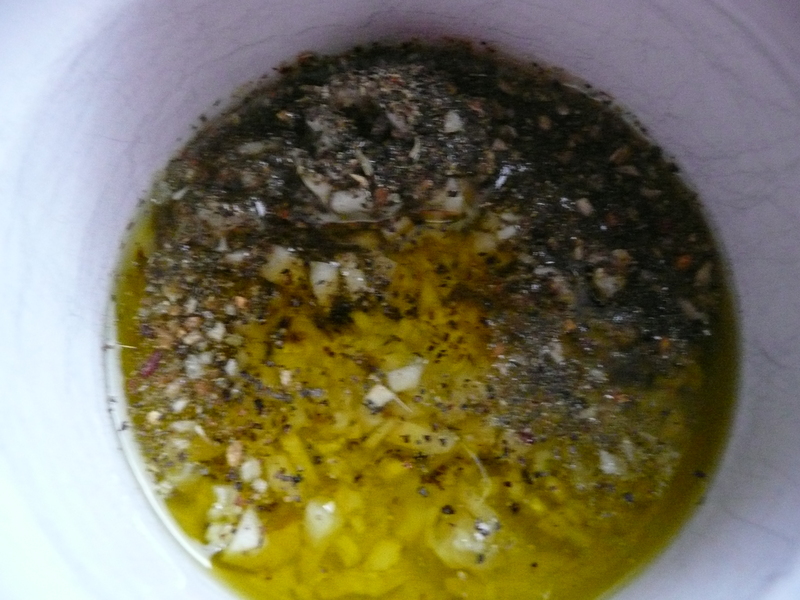 Chop lots of fresh garlic very fine and add to enough olive oil, mixed with black pepper, to coat all the shrimp. 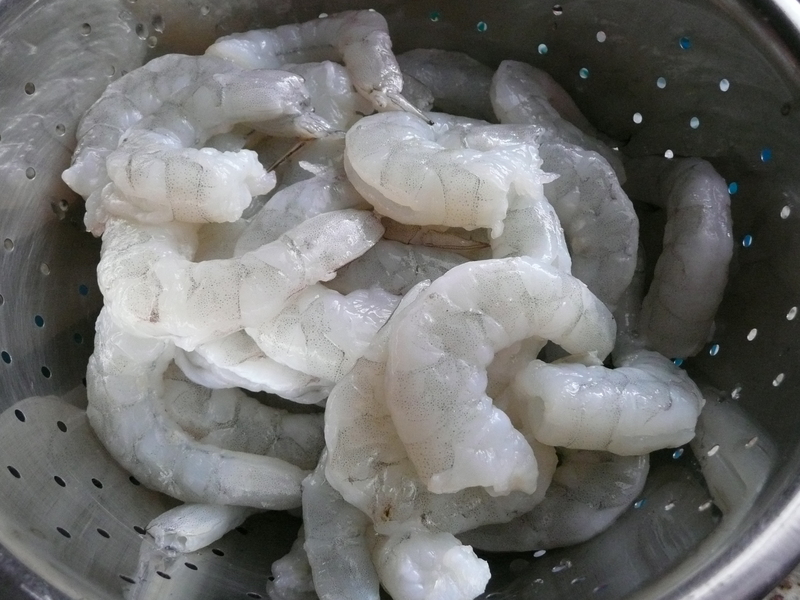 Place all the shrimp in a large ziplock bag and pour olive oil mixture over shrimp. Massage to ensure all the shrimp is coated, then place the bag in refrigerator for a few hours so all the flavors blend. 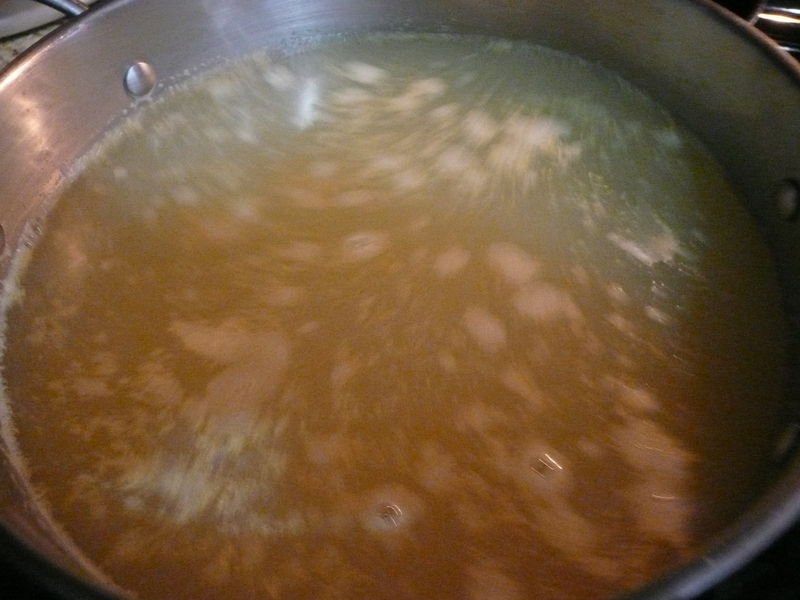 Anyway, if using the chicken base product, you bring a large pot of water to a boil, and add in 1 1/2 tablespoons of chicken base for each quart of stock needed. 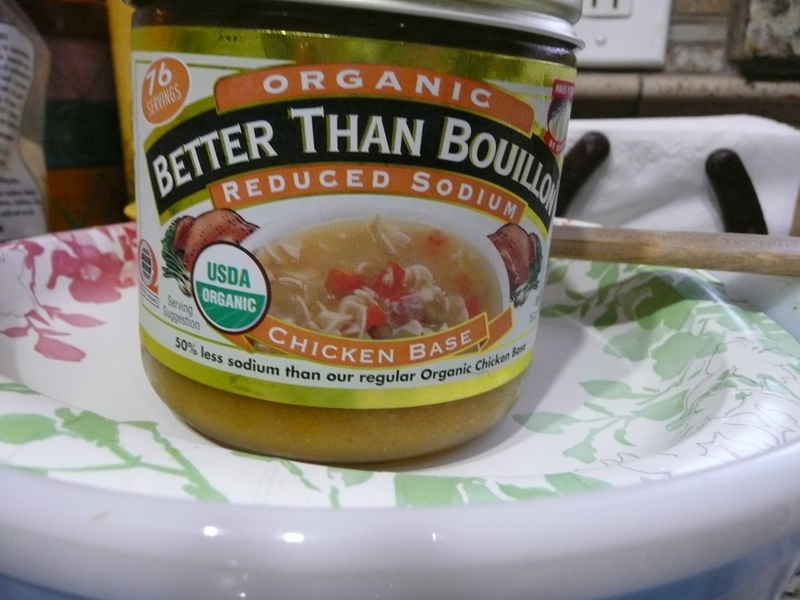 Of course, I just eyeball it according to what I think looks like enough… 🙂 If you are using boxed or fresh chicken stock, you bring enough of the stock to a boil to cook the noodles in according to package directions..
My husband and I love these pasta noodles the best. They are called Country Pasta and they are really good. They are wider and thicker than egg noodles. I threw the bag away before I got a good picture of it. But, if you Google wide pasta noodles you will see the bag on-line. I buy them at Fry’s grocery store right where you find packaged pasta and noodles. Cook the pasta noodles according to package directions if you like them really soft. We like ours a little firmer, so I cook ours about one and a half minutes less than the time on the package. While the pasta noodles are cooking, cook the mushrooms over medium heat until tender. Add shrimp, and continue to cook over medium heat just until the shrimp turn pink. Don’t over cook or the shrimp with be tough. 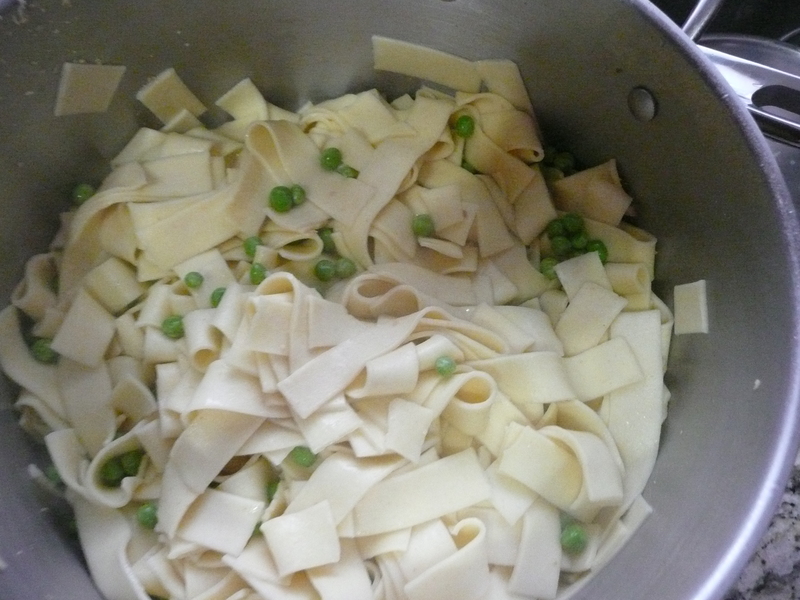 Just before the pasta noodles are done, I add some peas right in with the pasta noodle water, then drain the pasta noodles. 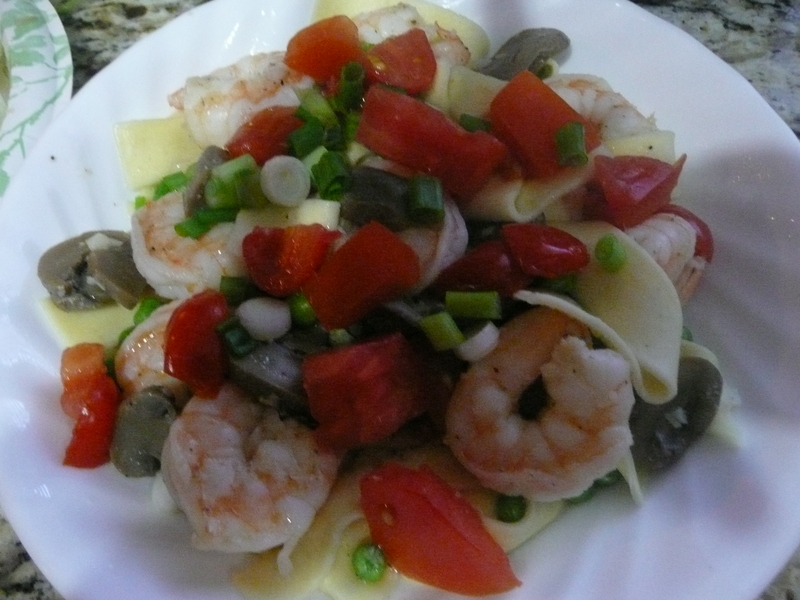 Serve the shrimp and mushrooms over the pasta noodles and peas, garnish with diced tomatoes and green onions for color and added flavor. However, Bill wouldn’t let me get in there and do a step by step photo session so I could share the recipe with everyone… Some cooks just want to keep their recipes a big secret… As you all know by now…, I don’t like keeping anything secret, so I will continue to share my recipes with those who care to have them. This is a picture my step-daughter, Katie, sent me of our granddaughter’s, her two daughter’s Emma, in the blue coat, and Alex, in the black coat, playing in the snow. 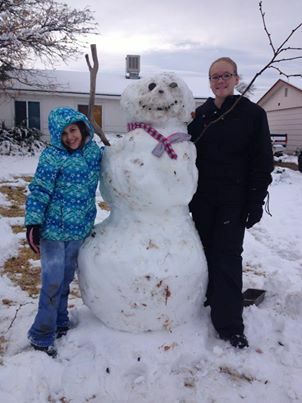 They look happy and delighted about being in enough snow to build a snowman bigger than they are don’t they? God bless their little sweet hearts. I love you both Emma and Alex so very much! It gets too cold for me right here in sunny Arizona, I have to brace myself every time our weather drops below 80 degrees. I just can’t handle cold damp weather. I like hot dry weather. 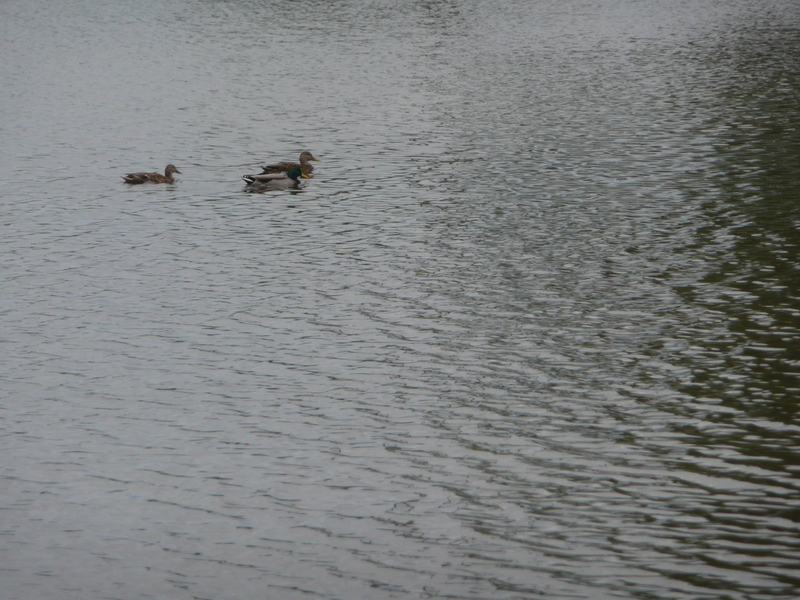 I don’t like hot humid weather, only hot dry weather. I do like to see the occasional rain storms we have here in Arizona. I love watching the monsoon storms roll in almost every evening in the summer. 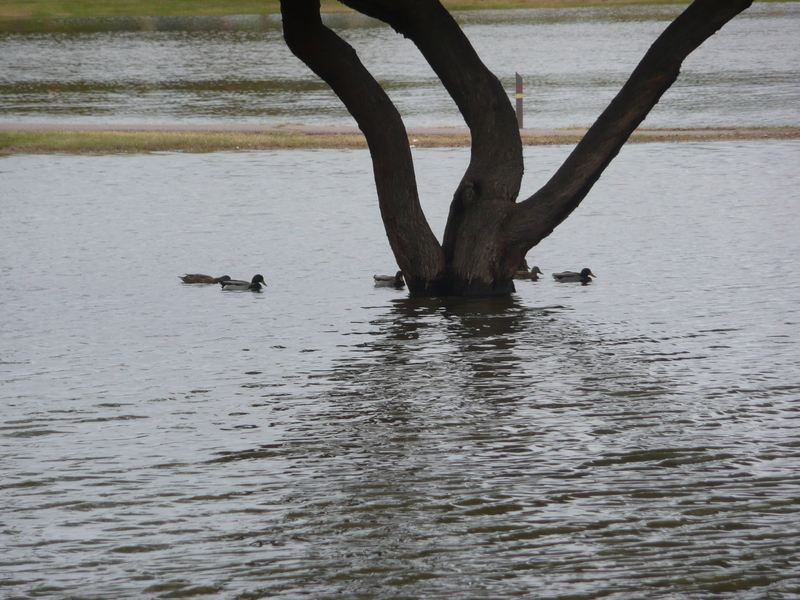 Our summer monsoon storms are warm rain storms. I will sit out on my back patio and watch the lightning, and listen to the thunder, for hours as the warm rain comes down and I love it! Our warm summer monsoon rain storms might cause a little flooding of streets and desert washes…but the show is over quickly and warm summer monsoon rain storm knows when to move on… But no, if you give cold winter rain storms an inch… she will take the whole nine yards and then some.. how selfish is that? 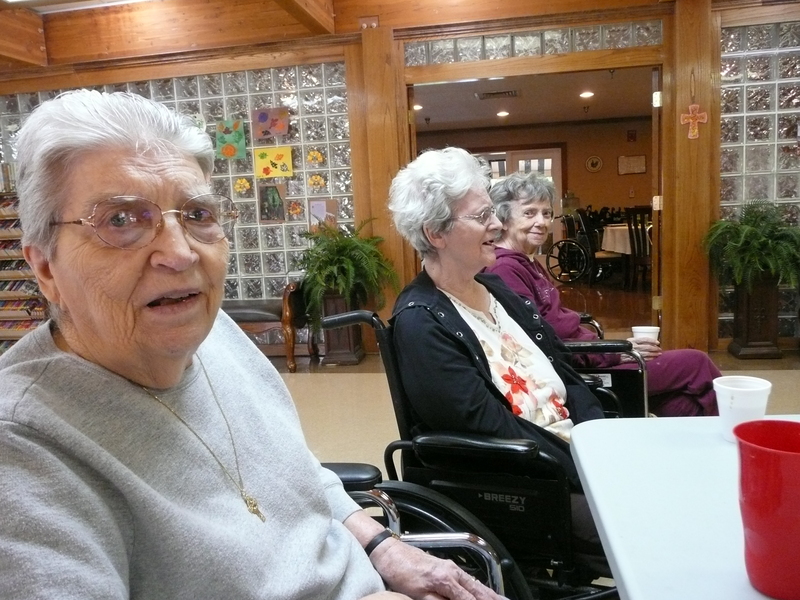 I went to visit my mother today and found her sitting in the activity room with several other residents who were very upset about some recent changes, Alan, the Care Center Administrator, made. Apparently, Alan, who has a wall full of degrees hanging in his office, decided he didn’t want the residents sitting around watching TV after breakfast anymore. He wants them to all be involved in some type of functional game or activity that will keep them moving and interacting with each other. That might sound like a bright idea to someone who is not in the know about how much the residents, that actually know what is going on around them, LOVE, LOVE, LOVE watching The Price is Right everyday. Keep in mind, this care center is not an assisted living facility. No, it is a 24/7 skilled nursing center. The majority of the residents living in this care center are not fully functional due to Strokes, Alzheimer’s, Parkinson’s, or any number of other medical issues… Many of them don’t speak or even know where they are. After bingo the residents go back to the dining room for lunch. Then they go to their rooms for a nap. At 2:oo p.m. they get up and go back to the activity room for another round of bingo… they all know exactly what to expect, nothing ever changes, and they like it that way…! 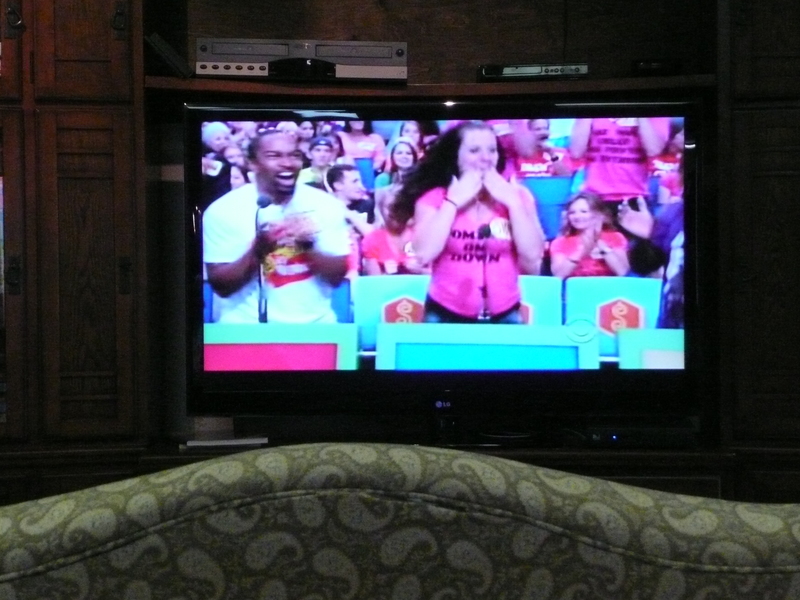 So Alan’s decision to not allow The Price is Right to be turned on anymore had the residents that are in the know…in an uproar to say the least. My mother and two of her friends, were fit to be tied when I got there this morning. 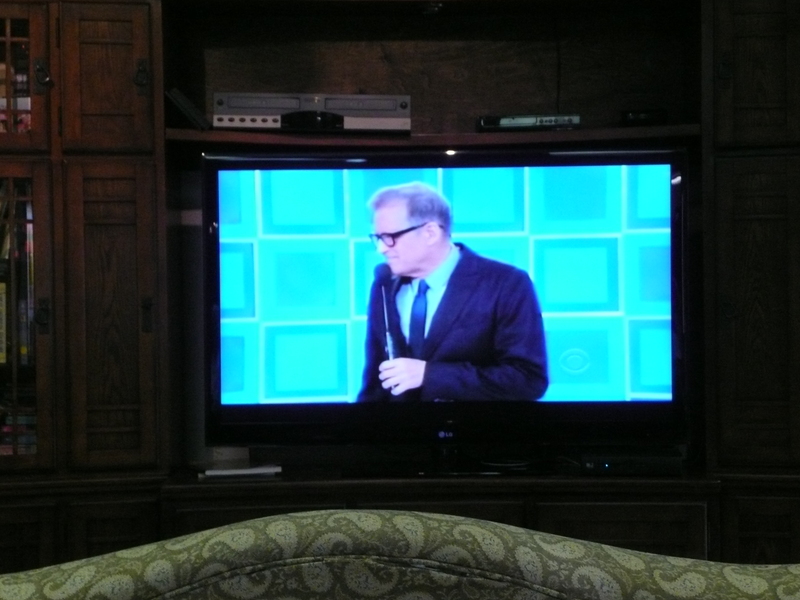 I asked my mother what was wrong and she told me they were not allowed to watch The Price is Right anymore. Her friend, Sharon, and Sharon’s roommate were almost to the point of tears. I asked my mother who told them they couldn’t watch The Price is Right. They all three said “Alan” I said who is Alan? They said “he runs this hospital.” I asked why Alan would say they can’t watch The Price is Right and they said “he wants us to do games.” Then they all told me they don’t want to play games, they want to watch The Price is Right. So I told them I would go and speak to Alan and see if I could find out what was going on.. I went to Alan’s office and knocked on his door. He looked up and asked if he could help me. I said” I’m hoping you will. Then I told him what my mother, Sharon, and Sharon’s roommate told me about Alan not letting them watch The Price is Right. Alan said “that’s right, I did put that order out to the staff.’ I said “may I ask why you made that decision especially since it is upsetting my mother and half of the other residents who live here?” Alan smiled and said “it’s not good for the residents to just sit and watch too much TV.” I said “well my mother is here because she needs 24/7 skilled nursing care, not to be dictated to about what she can and can not watch on TV. I told Alan many of the residents don’t have anyone coming to visit them and speak on their behalf, but I spend a great deal of time in his care center, and I know for sure that the majority of the residents are not able to participate in the “games and/or other activities he wants them to participate in instead of watching their TV program, and the residents that could don’t want to play his games/activities, they want to watch The Price is Right. I told him that show brings a lot of joy and excitement to the residents who enjoy watching it, and that since many of them are close to their last days..,their happiness, and overall well-being should be more important than his need to issue orders, especially when he apparently had no idea of the impact it would have on the residents. ” I told Alan perhaps he should come out of his office more often and see the effect his decisions have on the residents. Then, if he really cares about the well-being of the residents in his facility, he would rethink his decision and let the residents watch their show.” I also told Alan if he was going to continue to issue orders without consulting the residents and/or family members, I would start looking for another facility for my mother. I told Alan to think about what we discussed and “have a good day”, then I left his office. Much to my surprise, and delight, within a half hour, the Activity Director came into the activity room and turned on The Price is Right!!! 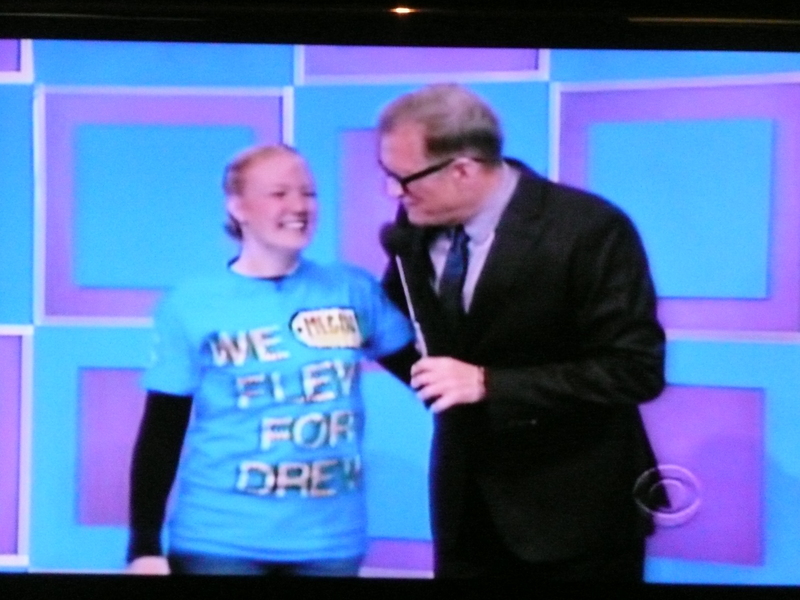 Who knew this simple game show could mean so much to so many?